More than 450 jobs are at risk at a site belonging to one of the UK's largest meat processing companies. Tulip Ltd's Boston plant supplies Marks & Spencer, but the meat firm said it had been unsuccessful in securing a new deal with the High Street giant. It said the site, which employs 464 people, would close in August if new customers could not be found. In response, M&S said it would do all it could to offer support to those affected by the decision. A spokesperson for Tulip Ltd, which employs about 7,000 people across 17 sites nationwide, said: "We have been notified of a decision in respect of a tender process with a key customer. "The outcome is not what we had expected and clearly we are all deeply disappointed by this news." The firm, which claims to be the country's largest pig farmer and producer of pork, said it would "explore every opportunity to minimise any impact on our people's livelihoods". 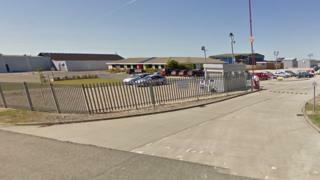 As a result, it said it would start a consultation with employees about potential job losses at its site in Boston, Lincolnshire. A spokesperson for M&S, which has worked with Tulip for about 30 years, said: "We understand that there are some impacts locally when changes are made, and we will always work with our suppliers to support them and make those changes in the right way. "While we won't be working with Tulip at the Boston site they remain an important supplier for other products and we will be doing all we can to support them as they consult with their team." Boston Borough Council said it would be working closely with Tulip and its employees "to support them through this difficult time".